When you raise a dog from puppyhood, you watch characteristics develop over time. You look back and see how that incident led to another or that experience contributed to this habit. But an old dog, in a new home, presents a different kind of discovery process. It’s been 8 weeks, and here are some things we’ve learned about and from Hoagie. First of all, he knows how to be a house dog. He circles our feet at meal times, naps when nothing is going on, jumps up ready to go when he sees me pick up my car key and follows us upstairs at night to sleep on what I call his “little bed” which is really my old cotton spread folded into a not-so-little rectangle. Proving he is 100% Bernese Mountain Dog, he employs The Lean. He pretty well likes everyone, dogs and people alike. He won’t come downstairs in the morning until LP does. 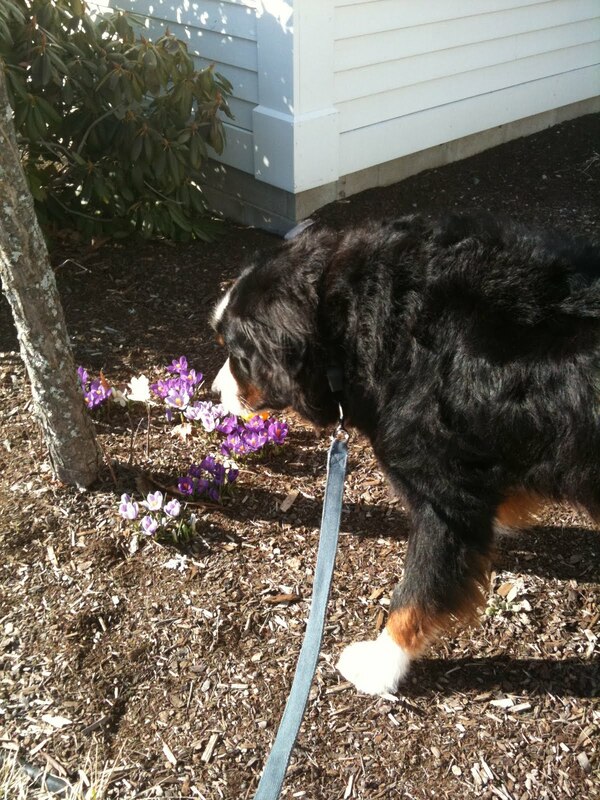 Like Ferdinand, he takes time to sniff the flowers. We know he has good taste, because he licks us. A lot. He loves our mailman. Despite the pouring rain, he squeezed past me to say hello this morning while I was receiving a package. In the midst of this storm, I learned that Hoagie is unfazed by thunder. This is a good thing, because I wouldn’t want him to be upset. But it perhaps makes me wistful for Molly, who used to head for the high ground (third floor) during thunderstorms. And it makes me think of Sam, who joined Molly once or twice as a puppy, then realized there was no reason to run up the stairs just because it was booming outside. But perhaps the cutest thing about him is that his favorite form of petting is what I like to call “Armpit Massage.” He will like on the floor all day if either of us will rub him right there. Oh, the look of bliss! Oh, the happy ears! Oh, the total relaxation of body and soul! He’s good to have around, reminding us to be unfazed, or at least to try, when life’s storms toss us in unexpected directions. I am so happy that Hoagie found you! I think I am in love with Hoagie. I'm so glad that Hoagie smells the flowers. And I bet the bliss of soul is for you as well as Hoagie. He looks a lovely dog.